In this post I will discuss the ease and necessary adjustments for a right fit. Remember, all knitting (and sewing) patterns are made for standard sizes. Vintage knitting patterns aren't multi-sized, if you want to make any adjustments you need to calculate it for yourself. Not surprisingly, when browsing vintage patterns from the 1930's and 40's you'll often find they are designed almost exclusively for 32-34" (81,5-86,5 cm) bust. Oh, women were really thin those days!... An exception are the sweaters and cardigans designed for elderly women. These patterns 'for the matron' were usually designed for 38-42 in bust (96.5-107 cm). Even the size 34 bust seems rather small these days so any average sized woman need to adjust vintage knitting patterns. But before that, one of the first things when starting to knit a new pattern is to determine the ease. Why is ease so important? Take a look at the pictures above. There are two sweaters, both with the same shape, a smaller ribbing along the waist then some increase, short sleeves with puffed shoulders and shoulder pads. I can tell you, even the shape of the pattern pieces look the same. Still, the right one from the 40's looks more fitted and shaped than the left one from the very early 90's. Why? The main difference is the ease. The 90's sweater looks quite oversized, it's like the other sweater but made several sizes too large, right? Of curse, it is an era-approprate sizing, but if you are not careful with calculating the gauge and the amount of stitches when adjusting the pattern you can end up with a garment just like that! Usually, knitted garments tends to stretch a bit when wearing. To achieve a nice fit for your vintage style garment you should calculate zero or negative ease when knitting. Before the 60's most garments were quite fitted. To achieve a nice fit for the torso knitted garments had to have a zero or negative ease at the bust and be even smaller at the waist. I think for your first jumper a zero (or slightly positive ease) is good to start with. Unfortunately, to achieve the fit you often need to alter the fit of the garment. Generally speaking to alter the size you need to cast on more or less stitches. You can calculate the exact amount if you know your gauge. As you can see above, simply enlarging the pattern doesn't always guarantee a great fit. The reason is in the relation between bust and shoulder size. You see, in the pattern in no shaping above the busts. After the decrease for the armholes the remaining stitches form the front and back above the bust level which equals the finished shoulder width. Simply enlarging the bust size can be sufficient if you don't have large size busts, because your shoulder width will increase just a little. If you try to widen the pattern you will widen the shoulder width too which will make your finished garment look like the 90's sweater above. To calculate the right fit you should take your high bust measurement instead of the full bust to make sure you have a nice fit across the shoulders. ...that the high bust measurement matches closely your shoulders? 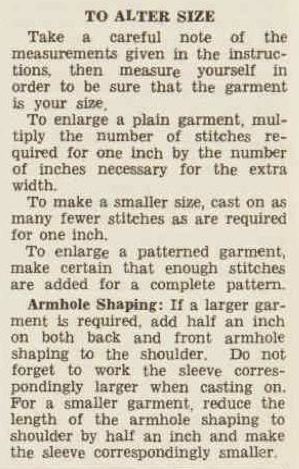 So you should use your upper torso circumference instead of your full bust, when choosing a 'bust circumference' size for vintage sewing and knitting patterns. So, what to do when adjusting the pattern for a larger bust size? Sewing patterns use darts to do this. It is not common to use darts on knitted garments, though it is possible to imitate the effect by using 'short rows'. Remember, it is always easier to make adjustments by adding stitches on the mostly straight part below the armhole shaping than above. There you should consider the decrease for the armhole shaping, the shoulder shaping and the neckline shaping as well. 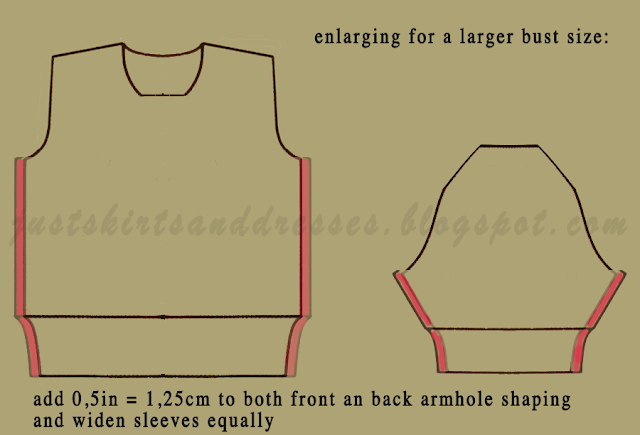 There are many ways to do this, but I only want to discuss the most simple method which the AWW advised back in the 30's and 40's: add 0,5 inch = 1.25 cm on both sides to the armhole shaping to shoulder, plus to widen the sleeves equally. Because of the adjustment of the armholes the sleeve caps need to be wider too. In both cases work away the extra stitches together with the normal armhole shaping. - When making a patterned garment you must consider the pattern you work with. 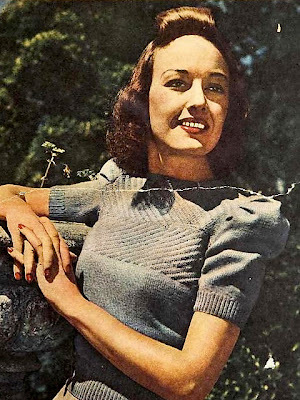 Vintage jumpers often have a patterned yoke which starts above the bust line or are fully worked in a (lace or other) pattern. When enlarging your garment, calculate the required amount of stitches and then look for the closest multiple of the amount of stitches of your pattern. Make sure you add one or more full pattern units. Making a drawing can help to visualize the placing of these. Good news: the diagonal pattern used on the Phillipa jumper doesn't require any adjustments. - Resize not only the width but also the length of your jumper! We tend to forget that vintage patterns are not only smaller but also tend to be short. Make the bodice under the armhole shaping longer if required. More about that in the next post of the series! If you have any questions please leave a comment.